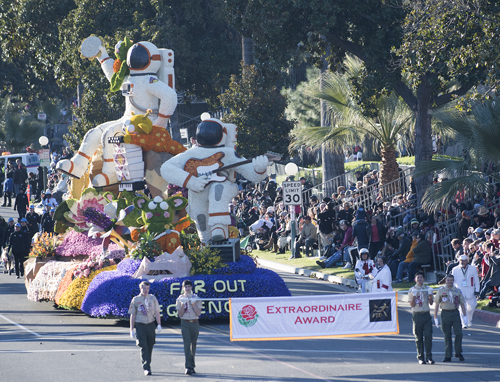 PASADENA, Calif. — Cal Poly universities’ “Far Out Frequencies,” featuring a pair of astronauts and a handful of animated extraterrestrials on an alien planet communicating through music, received the Extraordinaire Award for the most extraordinary float at the 130th Rose Parade® held New Year’s Day. The float, designed and built by teams of students from Cal Poly and California State Polytechnic University in Pomona, celebrates this year’s parade theme, “The Melody of Life,” by paying homage to music as a language for all. 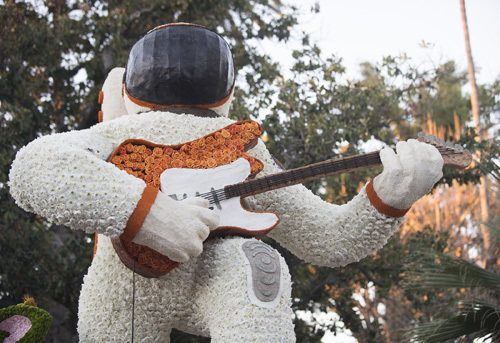 It is the fourth time in 71 appearances that the Cal Poly float has featured a space-related design. “It’s the first time we’ve every gotten this award, so we’re really excited about it,” said Sara Novell, a mechanical engineering senior who’s president of Cal Poly SLO Rose Float. “This includes all floats in the parade including those that are over 55 feet long. On the float, astronauts Morgan and Sally travel deep into outer space and land on a distant alien planet. Unable to communicate through language, they use musical instruments to share their message of goodwill with a handful of aliens, leading to out-of-this-world fun and some unexpected good times. 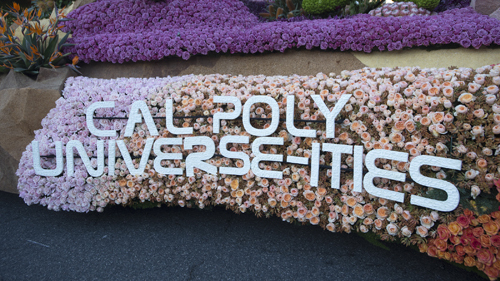 “The Cal Poly Rose Float is Learn by Doing on an international stage — one of our most well-known student-designed and -built projects,” said Cal Poly President Jeffrey D. Armstrong, who was in Pasadena to watch the parade. “Our extended Mustang family of alumni, family and float fans gush with Cal Poly pride over the hard work that transformed a drawing into a larger-than-life colorful spectacle. 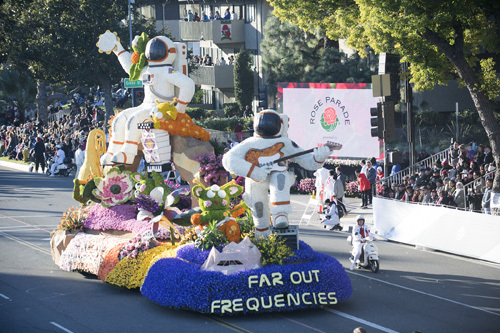 “Far Out Frequencies” was among 40 floats in this year’s parade. Rose Parade® officials estimate that 700,000 people see the parade in person, while 44 million Americans and an international audience of 28 million tune in to watch it on TV. The 49- by 15-foot entry, which stands more than 16-feet tall, uses animation to breathe life into this outer space close encounter. “The front astronaut strums a guitar, bobs his head and taps his foot,” Novell said. “The alien next to that astronaut mimics the guitar strumming motion. All the aliens have moving ears. On the rock arch, two aliens play with an accordion — one on each end — which moves. The concept was selected from more than 150 ideas submitted last spring by students, local communities, alumni and friends of the Cal Poly Rose Float program. 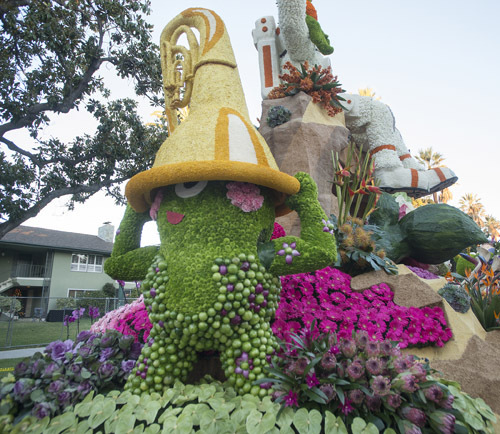 During the recent Decorations Week in Pasadena, the float was adorned with thousands of colorful blooms — including 7,000 roses, 7,200 Gerbera daisies, 3,200 irises and 200 red cabbages as well as white cushion mums, and button mums. Awards were announced by 2019 Tournament of Roses President Gerald Freeny about 6 a.m., two hours before the start of the 5½-mile parade down Colorado Boulevard. The schools were also honored for their commitment to California’s flower farmers. It’s the eighth consecutive year the float has earned the “California Grown” designation from the California Cut Flower Commission, which recognizes an entry decorated with at least 85 percent of cut flowers and plant materials from the Golden State. The Cal Poly universities’ float has about 90 percent of cut flowers and plant materials from California — including some that were grown on the Cal Poly campus. The schools enjoy a rich history in the Tournament of Roses® Rose Parade. Cal Poly universities has the sixth highest number of appearances (71) behind the city of Los Angeles (121 appearances), South Pasadena (109), and the cities of Alhambra (91) and Burbank and Sierra Madre (both 87 years). Since the fall of 1948, students from San Luis Obispo and Pomona have come together across 240 miles to produce the float — one of only six self-built entries — for Pasadena’s signature event. Since then, the two schools’ entries have earned more than 50 awards, including the 2018 Past President award honoring the most outstanding innovation in the use of floral and non-floral materials. In Cal Poly Rose Float history, Pomona student Don Miller is credited with spearheading the construction of the first entry. Built in the fall of 1948 in just 90 days with a $258 budget (about $2,700 in 2018 dollars), an exciting Cal Poly tradition was born on New Year’s Day 1949, when an enormous rocking horse rolled onto Colorado Boulevard. In the years since “Childhood Memories” demonstrated the creative teamwork of the Pomona and San Luis Obispo campuses, the Cal Poly universities Rose Float Program has established itself as an award-winning leader in the New Year’s Day extravaganza. Cal Poly student floats have used outer space designs three other times: Man on the Moon (1962); Way Out Welcome (1982); and 2011’s Galactic Expedition. All earned awards. The 2019 entry is no exception. A symbol of the partnership between the two campuses is the float’s chassis, whose front and back halves are joined mid-October each year in Pomona to officially unite both the float and the teams. Cal Poly SLO works on the rear chassis while their Pomona counterparts prepare the front chassis. The Tournament of Roses is a volunteer organization that hosts America’s New Year Celebration® with the Rose Parade® presented by Honda, the Rose Bowl Game® presented by Northwestern Mutual and a variety of accompanying events. 935 volunteer members of the association will drive the success of 130th Rose Parade themed “The Melody of Life,” on Tuesday, Jan. 1, 2019, followed by the 105th Rose Bowl Game. For more information, visit www.tournamentofroses.com. Like us on Facebook and follow us on Twitter, Instagram and YouTube.